& Deputy Chancellor, Catherine Branson QC Eleven people this year received the University of Adelaide’s highest honour – an honorary doctorate given in recognition of their outstanding achievements. Among the recipients was Professor Paul Zimmet AO, one of the leading diabetes experts in the world. Paul has a deep family connection with the University born out of the horrors of World War II. 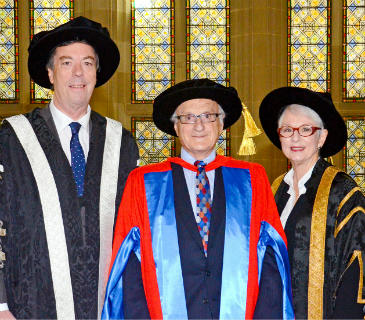 Professor Paul Zimmet credits the University of Adelaide with shaping his family history. His own outstanding clinical record in diabetes – he’s twice been listed as one of world’s most influential scientific minds by Thomson Reuters – began at the University in the 1960s. But what is most impressive is the story of how his family overcame adversity when they fled Poland in 1938, how they were given a new start by the University and their subsequent contribution to Australian society and the medical community. “There is no greater honour for me than to be recognised with an Honorary Doctorate from the University where I graduated in 1965,” he said in his acceptance speech at graduations this year. 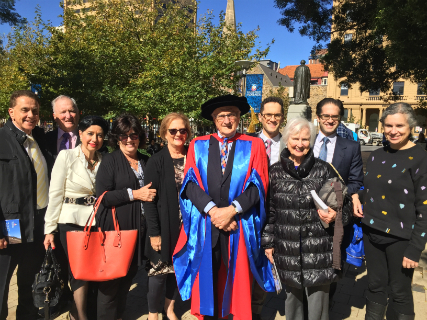 “But the story, with a humanitarian theme that I tell you about, connects this occasion with the graduation in medicine of my father, the late Dr Jacob Zimmet, here at the University of Adelaide exactly 75 years ago. Only a few months after his parents with his sister, Rena fled Poland, World War II broke out. The relatives they were forced to leave behind were taken to a Nazi concentration camp where many died in the gas chambers. After arriving by sea in Australia, Paul’s father found that his medical degree from the prestigious Vienna Medical School was not recognised as Austria was under German occupation. So, after living virtually penniless in Sydney for six months, his father moved the family to Adelaide. This is where their luck changed. Jacob – or Jack as he was known – was offered an opportunity by the University of Adelaide to re-qualify in medicine over three years. But Paul’s parents had to find supporting income and, as his mother had brought a sewing machine from Poland, they established a leather business. “Mum sewed and Dad skipped lectures at the Adelaide Medical School and rode his bike around suburban Adelaide selling the goods,” said Paul. Jack graduated with a Bachelor of Medicine and Bachelor of Surgery from Adelaide in 1942 and took up a position as a doctor with BHP in Whyalla. There he was idolised by his patients and many still sought his advice when he moved to Adelaide in 1950, where he set up practice working as a general practitioner and cardiologist. He became a role model for his children and was immensely proud that three of them, Rena, Leon and Paul, all studied medicine at the University of Adelaide. He was equally proud of Miriam, his youngest daughter, who became a teacher. “Like my late father’s experience, there are many from Europe who fled the Nazi terror and others from elsewhere who have made a great contribution to the South Australian community and indeed to Australia,” said Paul. And what an enormous contribution from Paul. He has made major breakthroughs in our current understanding of how lifestyle can have an impact on diabetes and strategies for prevention. He also co-discovered, with colleagues at Monash University, a potential new therapy for Type 2 Diabetes as well as a test for the prediction of Type 1 Diabetes that is now used worldwide. Paul was the Foundation Director of the International Diabetes Institute (IDI) in 1985 and later Director Emeritus of the Baker IDI Heart and Diabetes Institute until 2015. He is currently Professor of Diabetes at Monash University, and also has professorships at Victoria University and the Graduate School of Public Health, University of Pittsburgh. He served on the Australian Government’s Strategic Taskforce on Diabetes from 1997-2002, the National Preventative Health Task Force 2008-2009, and recently co-chaired the Australian Government’s National Diabetes Strategy Advisory Group to develop the National Diabetes Strategy 2016-2020. Paul and wife Vivien are extremely proud that their sons, Hendrik (a heart failure cardiologist) and Marcel (a behavioural paediatrician) have continued the family medical tradition as recognised experts in their own fields. In 1993, Paul became a Member of the Order of Australia and in 2001 was made an Officer of the Order of Australia. He has received Honorary Doctorates from institutions across the world, including Tel Aviv University in Israel and Complutense University in Madrid. Ten other leading figures were awarded honorary doctorates by the University of Adelaide in 2017: former Senator Amanda Vanstone, Foreign Affairs Minister Julie Bishop, Senator Penny Wong, plastic surgeon Professor Fiona Wood, mining executive Jacqui McGill, former State Minister Dr Jane Lomax-Smith, former University Vice-Chancellor and President Professor James McWha, legal philosopher Professor John Finnis, former High Court Judge the Honourable Michael Kirby, AC, CMG and Ms Andrea Mason, Chief Executive Officer of the Ngaanyatjarra Pitjantjatjara Yankunytjatjara (NPY) Women’s Council.